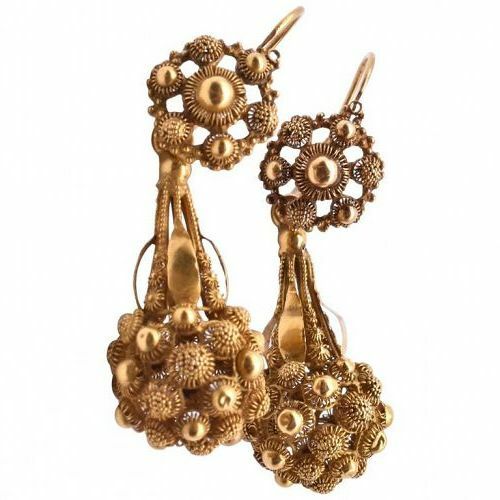 These lovely 18K day-night floral gold cannetille earrings boast one of the finest examples of cannetille gold work we have ever seen. Popular in both England and France in the 1820's, cannetille was a type of filigree work named after the gold embroideries of the Napoleonic era. It lasted for a brief 2 decades, making it easy to date a piece of jewelry that is as fine an example of cannetille as these. Typical of Georgian design, the tops of the earrings can be separated from the bottoms making them "day-night", with the tops suitable for daytime wear and the whole earring perfect for either daytime or a night on the town. They are approximately 1.75 inches long.